The Arctic ocean likely holds trillions of pieces of plastic in ice; as global warming starts to tick in and the ice starts to melt, all those pieces will drift into the oceans. Even though the finding has huge implications, it is so surprising that researchers don’t know yet how bad of an effect this will have on wildlife. The pollutants here are the small pieces of plastic – microplastics that form after the breakup of cosmetics and fibers released from washing clothes, according to the study. The concentration of plastic debris is 1,000 times greater than the infamous Pacific garbage patch – an “island” of garbage 2 times bigger than France. At the current melting trends, more than 1 trillion pieces 5 millimeters or smaller will wind up in the ocean in the next 10 years, researchers show. Rayon was the most common synthetic material discovered — 54%. 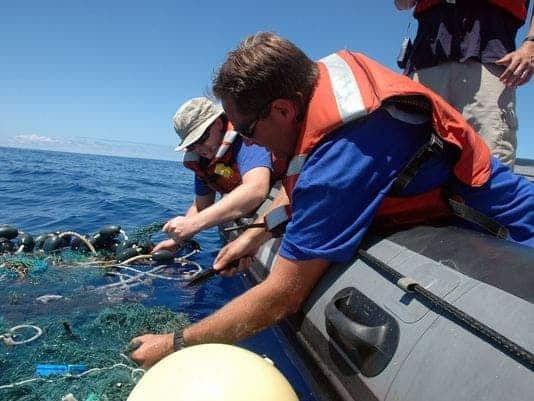 Even though rayon is not technically a plastic, researchers included it because it is a manmade semi-synthetic that makes up a significant proportion of synthetic microparticles found in the marine environment. Rayon is a cellulose fiber made primarily from from wood pulp, used in clothing and personal hygiene products. The other notable pollutants are polyester (21%), nylon (16%), polypropylene (3%) and polystyrene, acrylic and polyethylene (2% each). “While multiyear sea ice makes up a smaller proportion of annual sea ice cover in the Southern Ocean, and perennial sea ice cover around Antarctica is following different trends, our finding indicate the importance of sampling ice from the Antarctic to see if it too contains microplastics,” they write. This finding comes after another worrying study which showed that microplastic are a huge problem, perhaps even bigger than macroplastics. It’s high time we started putting a tighter leash on the plastic we are consuming and releasing into the environment, and even though there are several positive trends, like Hawaii banning plastic bags, San Francisco banning small plastic bottles and Seattle banning plastic and styrofoam altogether, at the global scale, we’re still miles away from a sustainable plastic usage.